A Maher family tradition were the ceremony is performed when a new daughter-in-law is welcomed into the new home. The ceremony will bring happiness and blessings upon the couple. In other family traditions the ceremony is associated with the first pregnancy, they will do this on the seventh month to call blessings upon the baby inside the mother to be. Some parents like to perform the ceremony for an infant boy some time after he has his head shaved at his balmuvara. They ask for Randal Matajis blessings for the new boy’s life. 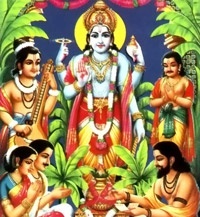 Also this is for when a boy attains the janoi, Randal Mataji will give blessings to the boy and make him safe and be successful in his studies. Other people do the ceremony for the joy and love for Randal Mataji. The ceremony is usually performed at home, to also give blessings onto the home. And the ceremony should be performed on auspicious days most commonly Saturday, Sunday and Monday. The priest should always be consulted over the best days for the ceremony. Everything should be planned in advance so stress is taken away. The priest will make a list of items that they need to get e.g. food artifacts and offerings that are required. The success depends how many goyni’s there are. Any woman caste or faith can be a goyni. The goyni must be fit to eat well but not be pregnant. On this day the goyni represent the form of Randal Mataji. The minimum number of goynies is determined by the number of lota used in the cremony. Lotas are always counted in pairs. With 14 goyni’s for each pair of lotas. The Matajis mudh is ready the priest has already came and set it up, however this room is very devotional and is reserved for mediation and devotional songs, food is prepared. Although Kheer and paar are done the following day. The priest arrives early morning and performs the puja, firstly prayers to lord ganesh and homage to him who removes obstacles. Flowers are given and ganesh is washed. 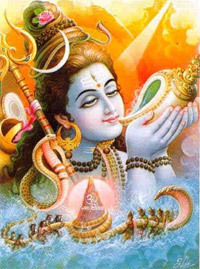 The priest will invite all gods and goddess, ancestors, planets holy rivers and Randal Mataji. During the puja two ghee lamps will be lit. Once lit, the lamps must remain alight until the ritual on Monday. The lamps are witnesses to the ceremony. They signify continuity throughout the following days of ritual. Milk is offered to Mataji and the priest may leave. Preparation of two spiritual foods, the kheer and paar. After the puja, the householders will go to Randal Mataji’s mudh to invite a Bhuy Maa or a Bhuvor in the form of Randal Mataji. Although the divine mother is everywhere-especially in our hearts-it is part of the tradition of the ceremony to extend a formal invitation. The house holders should carry kumkum, rice, friut and a coconut with them, as offerings. The bhuy maa or Bhuvor will explain his or her rituals at this time. The householders pray that Randal Mataji comes back to there home and bless them. It is still early morning by this time the special foods for the ceremony should be prepared. The kheer and paar should remain in the house at all times. The first person to be offered is of course Randal Mataji. Kheer and paar is offered in a thal. There are special garba sung at this time. The goynis arrive with there families, treat them with great respect as if they were your daughters. Randal mataji’s physical presence is one of them goynis. The first mark of respect is washing the big toe of the goynis feet. Attach few grains of rice to the chandlo; the big toe of the goynis foot is now washed. Bathe each goynis toe in turn with warm water, milk and warm water again. After the toe is washed, they apply another chandlo with rice to the goynis washed toe. Remember that the washing is an act of love and devotion towards Randal Mataji. The washing should be performed by a women, usually the lady of the house hold, If possible, it should be done in the shrine room. Complete your devotions to each goyni by offering her a present of a chandlo and sopari (betel nut). Other presents may be offered as well. During the stage of the ceremony, it is vital to keep an accurate count of the number of goynis who have had their toes washed. The success of the ceremony depends upon having the minimum number of goynis required by the number of lotas on the mudh. Having more than minimum number of goynis is not a problem. Now the goynis can eat within the household, but she must eat properly (several mouthfuls at least) – and she must eat kheer and paar first. After she has eaten the goyni is free to leave, although she is of course more than welcome to stay on. No kheer or paar may leave the house. It must be consumed within the four walls of the family home. Now is the best time to sing Mataji garba. The singing of the garba should be encouraged throughout the ceremony. They create a deeply spiritual atmosphere and they focus the minds of householders and guests on the wonderful event. Sunday afternoon around 4.00 pm everyone will gather around the shrine room for the singing of garba. I f there is a single best time to sing garba this is it. Mean while someone goes to the mudh to invite the bhuy maa or the bhuva over to the house where the ceremony is taking place. The bhuy maa or bhuva will become the channel through which Randal Mataji speaks to the devotees. 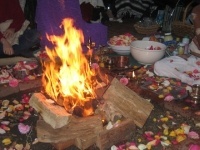 While the household continues to sing garba the bhuy maa or the bhuva will enter the shrine room and perform his or her own personal ritual at the mudh to prepare oneself for what is to come. This part of the ceremony is called the ghoro kundwo. As singing progresses the bhuy maa experiences surge of energy that transforms her into the mouthpiece of Matajis. The more love, devotion, and energy that the devotee put into their garba and into the ceremony the stronger is the presence of the deities during the “ghoro kundwo”. The householders will now ask Mataji through the bhuy maa whether the ceremony has been successful. They should ask for forgiveness for any mistakes. There is no particular form of words for this conversation words should be loving and respectful. ry the bhuy maa will guide the householders on the procedures to follow. After the thaal the devotees sing praise to Randal Mataji through the ritual known as aarti. Finally there are a few more prayers and then everyone can relax because the day’s ceremonies are over. However this is a useful time to pause for thought to consider the mystery and the meaning of the day’s events. After the aarti the householders fast is also over. They can at last enjoy the food they provided for their guests. But they should not forget their witnesses the two ghee lamps. They must keep an eye on those lamps overnight. For spiritual and for safety reasons it’s advisable for someone to sleep overnight in the same room as the lamps. Once again the house holders must fast until the mornings rituals have been completed. Daatan (a special toothbrush stick) and milk should be offered to Randal Mataji. The priest returns early on Monday morning to perform another puja. This puja gives thanks to Randal Mataji and gives her leave to go. It can take up to an hour and involves the priest and two householders. There is another special Prasad to accompany this puja. This puja comprises khuller and coconut. One coconut is offered for every two lotas placed in the mudh. This Prasad is the divine goddess’s breakfast. It is offered in a specific order: daatan; milk; khuller; and coconut. As always the priest will advise on the procedures. This puja ends when Randal Mataji leaves to go. 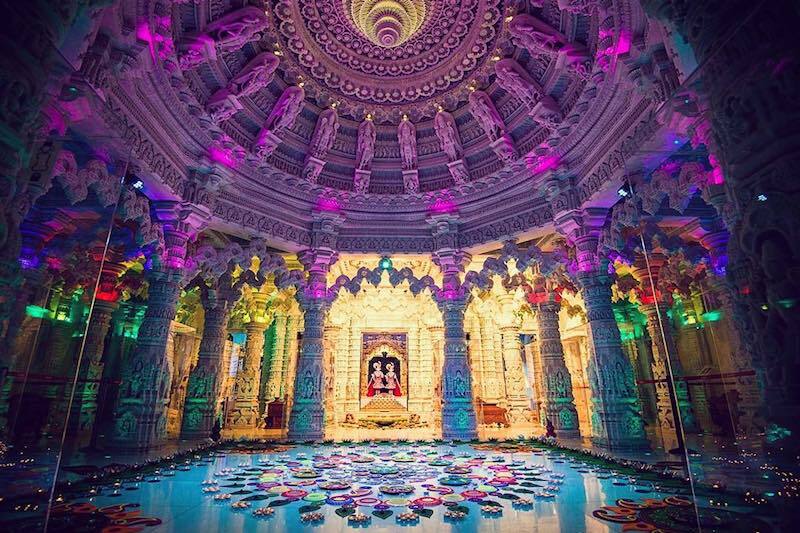 The ceremony must be completed by 12.00noon which then after is the mudh (mandap) is dismantled. After thought – Please don’t lose sight of the purpose of the Randal Mataji ceremony when studying in detail of the ritual. We are inviting the mother goddess to enter our homes with faith and with humility. We love and praise her because she loves us. If we approach her ceremony with good intentions minor errors will surely be forgiven.